St. Helena, CA – Nineteen students in the inaugural class of the new Wine and Beverage Graduate Certificate program at The Culinary Institute of America recently completed their studies. 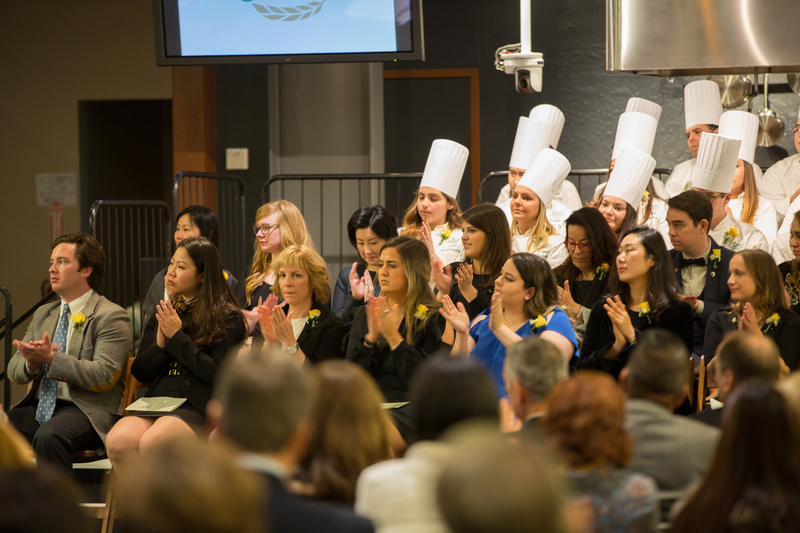 They, along with 20 students in the college’s Accelerated Culinary Arts Certificate program, graduated on March 24 at the CIA at Greystone in St. Helena, CA. The Wine and Beverage Graduate Certificate is the first graduate-level program offered at the CIA. Students in the eight-month curriculum taste hundreds of wines in class, take advantage of the program’s Napa Valley location by participating in field trips, and learn from the college’s expert wine faculty and guest lecturers. Courses focus on wines of the world, sensory analysis, and the professional business of wine, spirits, and mixology. Accelerated Culinary Arts at the CIA is for graduates of college hospitality, restaurant management, food science, and nutrition/dietetics programs. During their two semesters, students gain the hands-on culinary knowledge and skills to tackle the “food” side of the industry. Linzi Gay, general manager of Clif Family Winery and Farm, was the keynote speaker for the ceremony. A graduate of St. Helena High School, Ms. Gay holds a bachelor’s degree in marketing from California Polytechnic State University in San Luis Obispo. After college, Ms. Gay worked for the family’s Clif Bar & Company division that produces nationally known organic energy bars. She returned to the company in 2007, as director of marketing for the Clif Family Winery and Farm. Clif Family Winery and Farm sits high on Howell Mountain, and the company’s Velo Vino tasting room is on Main Street in St. Helena.